Finally, after a long and arduous process, Clan Thompson International, Inc was granted the above coat of arms by Lord Lyon. I won't go into the process for getting a coat of arms approved. It has taken my clan years and many thousands of dollars to get to this point. 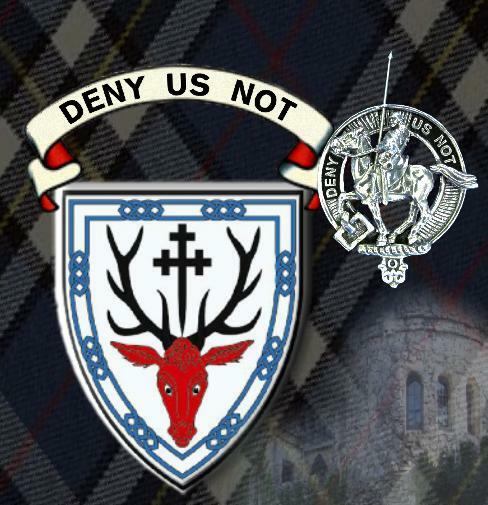 You can find links to the history and the process on the clan web site. Part of the process was proving that Thomson was a viable clan. We have a phenomenal number of people who worked very hard to trace names back to the 16th Century. This is a paragraph off our web site. The early 16th century Thomsons of Scotland were primarily concentrated in Lothian (Edinburgh), the Kelso area of the East Marche and the Liddesdale/ Debatable land of the West Marche. The 1587 Roll of the Clans included the Thomsons of the West Marche, i.e. Dumfrieshire. They are listed with Scotts of Ewesdale, Batesons, Littles, Glendinings, Irvings, Bells, Carruthers, Grahams, Johnstones, Jardines, Mofats and Latimers. It is clear that these neighboring families were never “can”in the modern accepted sense of highland Clans. They were, however significant families with “chiefs, chieftains and captains” and some became recognized by Lyon as modern clans: Little, Irvine, Bell, Graham, Johnston, Jardine, Moffat, Elliot, Armstrong, and Maxwell to name a few. While we have been allied with any of the above clans, we were a clan in our own right. Lord Lyon needed that proof, however, before granting us a coat of arms. The one thing we don't have is a clan chief. The process for establishing oneself as a chief is longer and more costly than getting a coat of arms. Don't look at me that way. I may be able to prove where my father's family lived but I don't have the time or money to pursue clan chief. Plus, my claim may be tenuous. My father's family was from Fife, not Dumfrieshire. We were not part of the Border Reiver community, at least not that I have yet determined. Lord Lyon required strict genealogical evidence and I'm only back to 1764. In reality, it matters not to us where your family hailed from, whether you're even a Thom(p)son or, heck, even Scottish, as we have a couple members who are members because we're cool. We are all family, united by the same interest and purpose. I'm extremely excited that this part of our drive to be a recognized clan has ended. I wear my tartan with pride.